Will You Support the Foundation's Laminitis Research In Return? The challenge of laminitis is bigger than any of us, but it's not bigger than all of us. 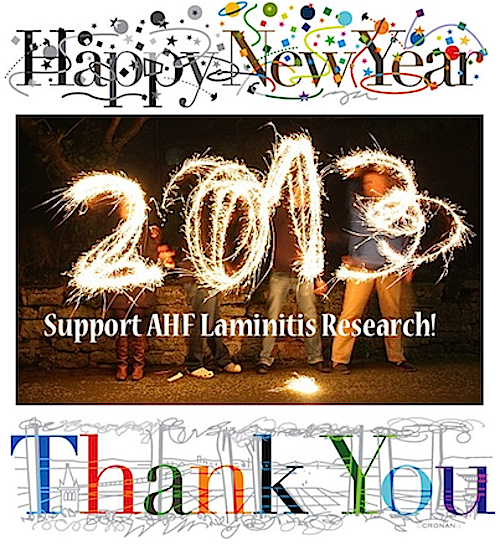 Please end your old year begin your new year by funding research that benefits horses who have laminitis today, and that will prevent future horses from getting laminitis in the first place. Laminitis research through the Animal Health Foundation attacks the disease on many levels, from the most high-tech science to simplifying insulin resistance testing. We're fighting laminitis in the laboratory, in the vet hospitals, in the shoeing shops and--most of all--in your barn. And your neighbor's barn. But AHF doesn't stop there. in research by the AHF. Our research is affecting what goes on in the feed store--and the seed store, too. On the hay truck. In that bucket of supplements you just ordered, or the contents of the horse treats you just stuffed in your pocket. The Animal Health Foundation attacks laminitis on all these fronts because everywhere we look, we see laminitis that could have been prevented--if we'd only known a year or two ago what we know now, thanks to the funds that you have put into the study of this terrible disease. Did your horse have laminitis in 2012? the chance of your horse having laminitis in 2013 has been reduced. As you know, laminitis affects horses of all ages and all breeds and you only have to visit an auction or horse rescue farm to see how many unwanted horses have come to these places because of either active laminitis or evidence of a history of the disease. No matter how large or small your donation may be, your dollars will get you involved in the forward progress of our work to stop laminitis. We can do so much more for horses, with your help. you ended your year on a horse-helpful note. Please contact AHF if you'd like to know more specific information about our future research projects that are in need of funding support and remember that your donations--large and small--have made a huge difference in fighting this disease in the past and will in the future, as well. P.S. Be sure to sign up for the Animal Health Foundation's email newsletter to receive the latest news; the box is in the upper right corner of this web page. Follow AHF on Twitter, too. And have you had a chance to "like" our Facebook page yet?